Wow. I haven’t been this sore since my first day on the Aussie Camino in 2014 when we did 36km from Portland to Cape Bridgewater via Nelson Lighthouse. That’s where I met Sean all those years ago. I also completely buggered up my right knee walking up and down the sand-dunes, and ended up walking the rest of the way to Penola with my knee strapped and braced. 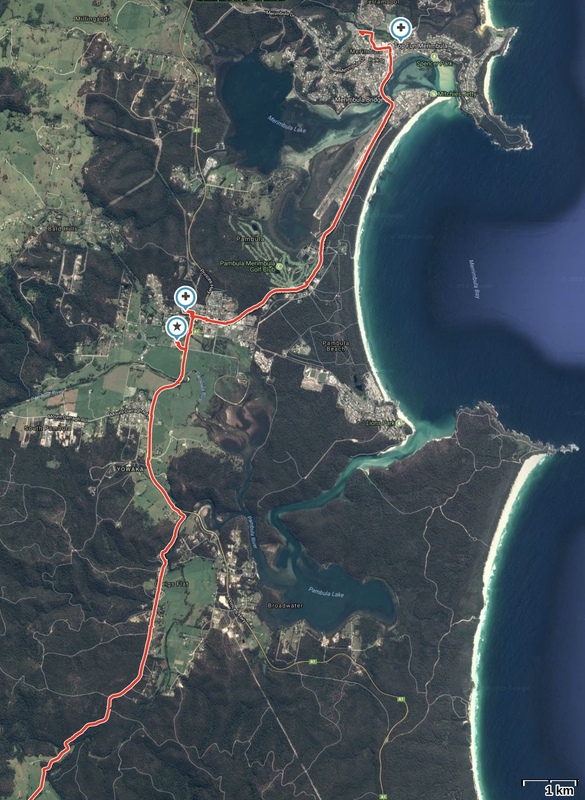 Well, by the time we got to Pambula – with still 7 or 8kms to go to Merimbula, my knee was again playing up, and as I was walking up the driveway of the Sapphire Valley Holiday Park just after dark, my right foot was screaming “Blisters!!!”. Thankfully, I think I have dodged that bullet, but only just. It has been a long day. We have averaged in the past 27-28kms a day, with the longest day we have ever done been our 36km day from Goongerah to Bendoc last year (which included a 700m rise as well). But then we were not carrying 12kg packs on our back. So it was a hard day today. We left Mike and Judy’s place at 8:10am (very thankful for a comfortable and hospitable night), and headed directly for the Nethercote Road. The road was actually quite busy – but at that time it was probably people coming and going for work. We were somewhat discouraged, and tried for a time to take a side track which ran along the road a little down in the valley. However, that track was far too much up and down for our knees, and we soon returned to the road, where the traffic was settling down a bit. I found it slow going to start with. This and that on the backpack needed adjusting, or something from one of the belts were digging in on my hip, or my water bladder was leaking etc etc. Once we got under way, things were great. It was a wonderful sunny crisp morning, with really fresh sea/mountain air. However before long we ran into a difficulty. Right back at the start of our pilgrimage, on our second day on a hill the other side of Belgrave, Sean and I turned around to find Josh standing at the top of the hill looking down and completely stationary. It was the first time that we discovered that Josh suffered from vertigo and any steep or high trails caused him some difficulty. 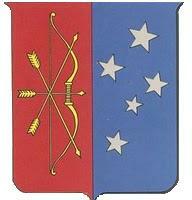 In fact, he got used to the trail and all was fine for the whole journey to Orbost. We thought he was over it. But when we came to going over the mountain in Easter 2017 from Orbost to Eden via Bombala, Josh pulled out. Turns out the reason was that his vertigo has not come any better. So today, heading out of Eden, we had to climb up to 293m over the mountain before we entered the Nethercote valley, and half way up, Josh froze and said he couldn’t go any further. The solution was to ring Mike and Judy and call upon them to come and take Josh over the hill, which the good people did. So Josh was about half an hour’s walk ahead of us until we caught up with him at the Nethercote hall for lunch. The Nethercote Valley is much smaller than the Towamba Valley, but equally beautiful. The little community hall was a bit of treasure, and we enjoyed sitting on the veranda at the back and eating our bread, cheese, kransky, and fruit (I missed the usual glass of red wine to wash it down). Josh headed off again on the road to Pambula while Sean and I were still repacking our bags and before we left a local, Karen, turned up to drop some stuff off at the hall. We fell to talking, and she described the work that had to go into renovating the dilapidated hall about 10 years ago (it was built in 1910). “We didn’t so much restore the hall as restore the community in doing so,” she said. I have found that to be true many times on our journey, where the local community hall in small rural settlements has been the focus of community life. The road from Nethercote to the Princes Highway was much quieter than the main road through the Nethercote Valley. It altered between gravel and bitumen road, but was easy to walk. Along the way today, I was constantly being contacted on the phone by various people interested in our story. Jodie Stewart, from the Eden Magnet, wanted to meet up with us in Pambula. Sandra, the parish secretary in Pambula, rand to offer to open the Church for us. John McLaurin, the editor of the Catholic Voice archdiocesan newspaper rang to ask for some video footage for the morning edition of their roundup. I rang Chris and Ray who live in Nethercote and with whom we had dinner last night. I texted a couple who run a drop in centre in Pambula whom we met at Towamba on Anzac Day last year to see if we could “drop in”. And my Aunty Jan texted to say she was back from her holiday in Cuba and to wish me happy travels. Josh said “Stop playing with your phone all the time,” but I felt I had some obligation to get the news out on what we were doing. And of course, I was tweeting about our journey too (although there was a blank spot in the valley itself). At the same time, it did feel that it was all getting in the road of concentrating on the walking. At the end of the road, just before we got to the Princes Highway, the Yowaka River which flowed alongside the road from Nethercote suddenly widened out and became a tidal river connected to the Pambula River. It looked so inviting, I would have loved to have gone for a swim – but we didn’t have a spare moment. We came out onto the Princes Highway – by God, that was a shock. After the peace and quiet of the country roads, we were on a busy highway in the bright sun, with constant traffic including semi-trailers and caravans and four-wheel drives towing boats. There was little space on the side of the road to walk, and the traffic was whizzing past just metres away. Take my word for it: for walkers the Princes Highway is a road TO BE AVOIDED. As we came into South Pambula, I rang Sandra to tell her that we would be at the Church within half an hour. Little did I know that fate had placed a great temptation before us along the way: the first micro-brewery of the journey! I felt we were obligated to get to the Church, but Josh mutinied and insisted on buying us all a beer. We went into the Longstocking Brewery and met the new owners who have been there only three days (the brewery itself is about 3 years old). Josh bought us each a Bohemian Lager, and the staff gave us a free sample of Fatty Arbuckles Dark Ale as well. We were tempted to buy their aluminium “growler” for takeaway tap beer, but at least realised that that would be unwise. So we were a bit late getting to St Peter’s Church, a beautiful “storybook” building nestled in a little glade on the hill above Pambula near the old Courthouse. The sign on the wall out the front of the Church had a fitting question: Quo Vadis? The Church itself is the oldest continually used church in the Canberra-Goulburn diocese, having been built in 1865. We were met there by Sandra, the parish secretary (who had a stamp to put in our passports), John Liston, a local historian very keen on Mary MacKillop, and Jodie Stewart from the Eden Magent. After singing the Regina Coeli and saying the Lord’s Prayer and a prayer to St Mary in the Church, we sat in the meeting room out the back so Jodie could interview us on our project. We were very interested to learn that she was doing her PhD at University of Wollongong on the cultural significance of the Bundian Way project – so she had a lot of sympathy for our own pilgrimage. We left there at 4:20, refreshed but eager to be on our way, as the office at the Sapphire Valley Holiday Park closed at 6pm. The Pambula Inspirations drop in centre was already closed when we walked past, so we missed catching up with Pastors Rob and Robyn Nelson. 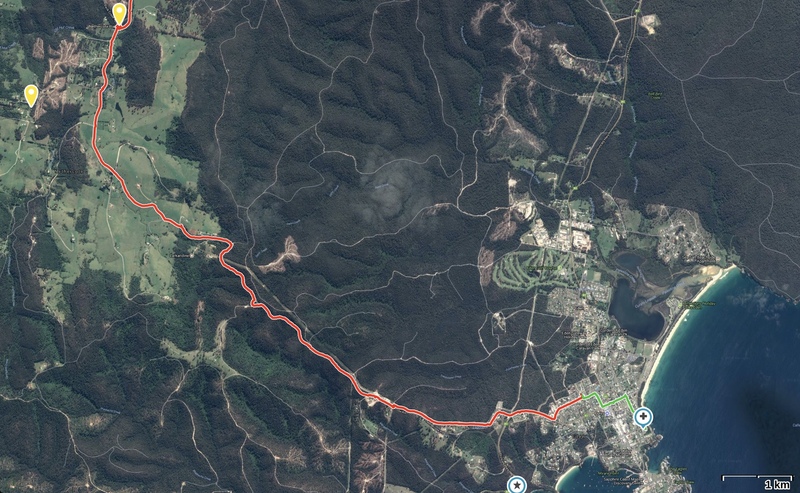 We had to walk along the highway still, but the benifit now was that there was a good sealed walking trail running alongside the road all the way from Pambula to Merimbula. We thought it would be an easy walk, but we were more tired than we thought, and every step was soon an agony. It was dark before we arrived at the Park, and the office called me just as I was walking up their stairs as they were about to shut. Our room is very nice, a “family room” for $115 a night. We showered and refreshed ourselves and rubbed lotions on our feet and muscles before heading out to the local Club for dinner. I ordered Lambs Fry as I thought I could do with the iron hit, and the other two did the same. A nice glass of Kosciusko Pale Ale washed it down. We then went around to the Woolworths and bought supplies for breakfast and lunch tomorrow. Sean and I wrote up our journals as Josh hit the sack. It’s now half past eleven, and I desperately need to sleep. So follow me on twitter at @scecclesia – or see the side bar of this blog – and take a look at the pictures for today on Google Photos. Update on today’s journey: we make it about 32km that we walked from our accommodation to Merimbula via Nethercote. It would have been closer to 34km had we left from the Church, but we did that little bit last night. Here are the maps of today’s journey. It is fairly straightforward as we followed the road all the way.